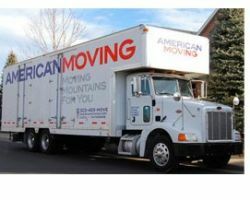 From local to nationwide moving services there is nothing that American Moving won’t be able to assist you with when you are changing your home. They have the right amount of knowledge and experience needed to make sure that your belongings make it to their destination every time without any chance of them becoming damaged. With the most advanced equipment and quality moving vehicles these apartment, commercial and house movers will exceed all of your expectations from the minute they arrive to pack up your possessions to when they are delivered. Arrow Moving & Storage Co. The wide range of services that are offered by Arrow Moving & Storage Co. is why so many residents of Colorado are using their services. These expert movers and packers have helped their clients with: international moves, office relocations, specialized services such as piano moving, full commercial moving services and a range of storage solutions. Requesting a free quote from their customer service team will show you just how affordable the prices are that Arrow Moving & Storage Co. charge for their quality assistance. Amongst Colorado Springs movers, Olde Towne Moving & Storage stands out for their attention to detail. One of the unique aspects of this local moving company is that they offer interior designer services, which means that when they move you into your new property they will be able to offer expert advice on furniture placement as well as office layout. Reviews of their work always praise how reliable and understanding each member of the team is and how the customer didn’t have to worry about a thing during the move. When it comes time to choose who will be responsible for getting your entire home from one property to another you don’t want to settle for a cheap low quality service. United Van Lines is not only one of the leading moving companies in Colorado Springs, CO, but they are known throughout the country for being one of the best. Having access to a network of some of the most professional movers in Colorado will mean that your relocation will be as stress-free as possible. 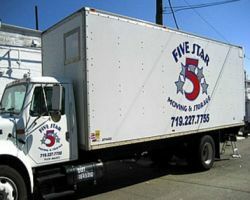 5 Star Moving & Storage Inc. Since 2007 5 Star Moving & Storage Inc. has been providing a highly professional service to residents and businesses throughout Colorado Springs and the surrounding area. 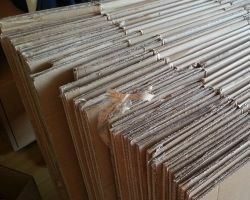 This service is able to assist with long distance moves or residential relocations that are just around the corner. In addition to getting your belongings to their destination completely safe they are also able to assist their clients with packing the items to ensure they don’t become damaged in transit. This company is an military approved shipper and packer, which means they really are the best in the state.